Normally, after the web server receives the output from the WebFOCUS application server, it returns the entire report output to the viewer. The on-demand paging facility provides significant performance advantages by downloading one page of HTML report output to the viewer, instead of the entire report. When you request data using on-demand paging, the WebFOCUS Reporting Server receives the entire report, but sends only the first page to the viewer and holds the remaining pages on the servers disk, awaiting your signal to send other sections of the report. Your viewer window is divided into two frames: the upper frame displays one page of report output. The lower frame provides controls that you use to display report pages and search report output for specific strings. For details, see Navigating With On-Demand Paging. Note: This feature is only available if you are running HTML reports remotely on the WebFOCUS Reporting Server. The following image shows HTML report output in your viewer using on-demand paging. Note that the first page appears in the main panel, with navigational controls in the panel. Format the report output as HTML. On-demand paging requires that report output be formatted as HTML. If your report default is HTML format, you can simply create a new HTML report. If HTML is not the default, you can set format to HTML from Report Painter. See How to Format a Report as HTML. Enable on-demand paging. This setting activates on-demand paging for your report. You can enable on-demand paging through Report Painter. See How to Enable On-Demand Paging for HTML Reports. Select a WebFOCUS Reporting Server to run the report on. You must select a WebFOCUS Reporting Server to see on-demand paging results. If you do not select a server, you will be prompted to select a server when you run the report. Run the report. When you run the report, on-demand paging delivers the first page of the report output to the viewer and holds the remaining pages on the server disk. A page of report output is determined by the number of lines per page. You can set the viewer to display a specified number of lines per page using the SET LINES command. You issue this command either using the Set tool or by manually including it in your request from the Text Editor or Command Console. If you do not specify a value for the SET LINES command, the viewer defaults to 57 lines per page. For more information on SET commands, see Customizing Your Environment in the Developing Reporting Applications manual. In Report Painter, click the Options button to open the Report Options dialog box. Select an HTML Styled report format from the select output format drop-down list. In Report Painter, select Features from the Report menu. The Report Options dialog box opens. Select On-Demand Paging on the Features tab. In the Text Editor or Command Console, administrators and developers can add the SET WEBVIEWER=ON command to a procedure to enable the on-demand paging attribute. The SET command may be placed outside or within the TABLE request. See Viewing Reports in the Developer Studio Viewer for an example. The following report request generates the same report output. In this request, the SET commands are placed within the TABLE request. To see the output generated by these procedures, see Viewing Reports in the Developer Studio Viewer. When on-demand paging is enabled, the viewer displays one page of report output and navigational controls. You use the navigational controls to change the report page that appears in your viewer. The viewer consists of two frames, the Report Frame and the Viewer Control Panel frame. The Report Frame is the larger frame and contains one page of report output. When you first run a report, the Report Frame contains the first page of report output. 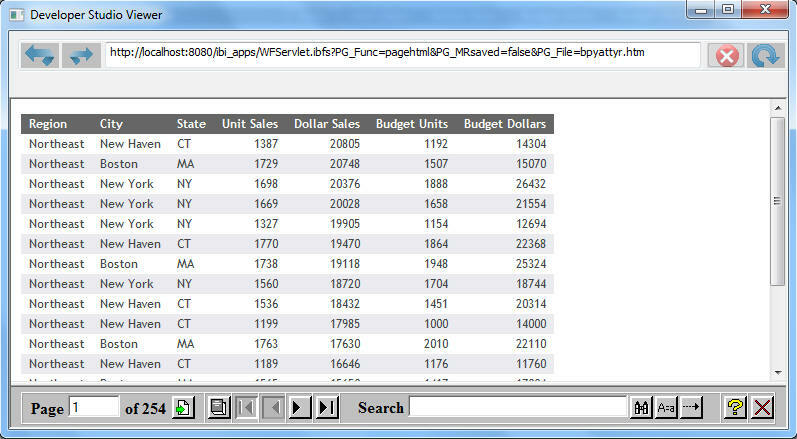 The Viewer Control Panel frame contains the controls you use to navigate through the report and to search for a string. The navigational controls allow you to display the next or previous page, the first or last page, or to display a specific page. You use the searching function to have the viewer locate a page of the report that contains a search string you specify. Enter a page number in the Page input box. To display the previous or the next page in sequence, click the Previous or Next arrow button. To display the first or last page of the report, click the First Page or the Last Page button. To download the entire report to your viewer as a single document, click the All Pages button. Your viewer displays the entire report without your viewer Control Panel. You can return to viewing a single page of your report by clicking the Back button on your viewer toolbar.